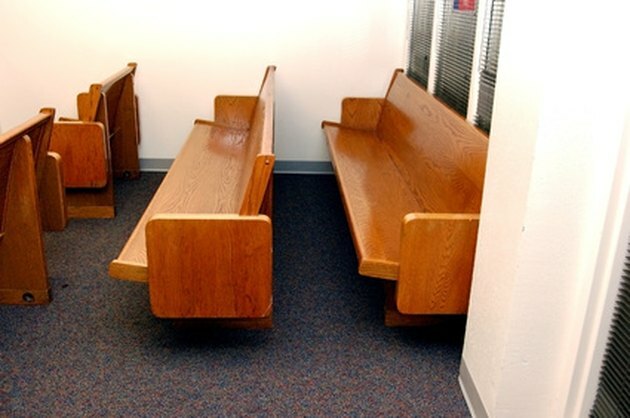 Pews remain common seating in churches around the world. Contemporary churches often offer cushioned pews for members to sit on, while solid wood pews are found in many traditional churches. Some pews are equipped with accessory racks to hold writing and worship materials. Wooden pews are exposed to body oils and loose surface dust, which accumulates and makes the pews appear dingy. Clean pews are appealing to members and essential to church maintenance. As with any wood furniture, certain supplies are effective at cleaning wooden church pews. Properly clean and maintain church pews. Moisten a clean soft cotton cloth with water. Wring out all excess liquid from the cloth, so that the cloth is barely damp. Wipe the first pew thoroughly with the damp cloth to remove all surface dust. Dust all intricate carvings and hard-to-reach areas of the pew. Follow the wood grain at all times. Dampen another clean soft cotton cloth with mineral spirits. Dip a soft bristle brush in the mineral spirits, as well. Rub the damp cloth over the pew to remove grease residue, oils and grime. Rub all carvings and crevices in the wood with the soft brush. Rub the cloth and brush in the direction of the wood grain. Dry and buff the pew with a clean microfiber cloth to add shine. Repeat the entire process on the remaining pews.